I didn’t go, of course, but ever since then I have had to studiously avoid letting anything involving dark chocolate, caramel, and salt into my line of sight if I don’t want to devour it instantly. But, now and then I unleash the beast and allow myself to indulge. A run to a fancy cheese shop with a friend revealed a source of Fran’s chocolates within biking distance! Jackpot! I also assisted in the photo studio at Stonewall Kitchen this summer, and guess what one of our shots for the holiday catalogue was!!! It was a major exercise in self control not to elbow check the photographer, take out the recipe developer from behind, and rip the lovely plate of candies out of the food stylist’s hands. Naaamnamnamnam. Thank goodness we each got to have one once the shot was over! Recently I was reading about some small, local artisan food producers in this area and I saw the words “salted caramel ice cream.” I didn’t follow up right then, but the words had burned themselves into my brain, floating there, taunting me, refusing to let me forget that I WANT!!!!! So finally, I decided on a project. Most of the time I don’t have the patience for something terribly involved, but every now and then, I get a bee in my bonnet and decide to take on a project. I have no ice cream maker, but I stumbled across instructions for how to make ice cream without one from ice cream and dessert maker extraordinaire David Lebovitz. I figured if I am willing to put in the effort to make a batch of salted caramel ice cream from scratch then I would deserve to eat at least one bowl of it with no guilt whatsoever. Now the question was, how do you make salted caramel ice cream? Not surprisingly David Lebovitz came to my rescue again with a recipe on his blog for exactly this flavor, thereby making him my hero for all time (imagine being rescued on a swinging piece of jungle twine and being carried to a land all full of perfectly creamy, dreamy ice cream – see what I mean?). I followed his recipe for the ice cream base and freezing exactly, however instead of adding in pieces of caramel brittle, I added dark chocolate that I had chopped into tiny pieces. Holy frozen full fat dairy product! 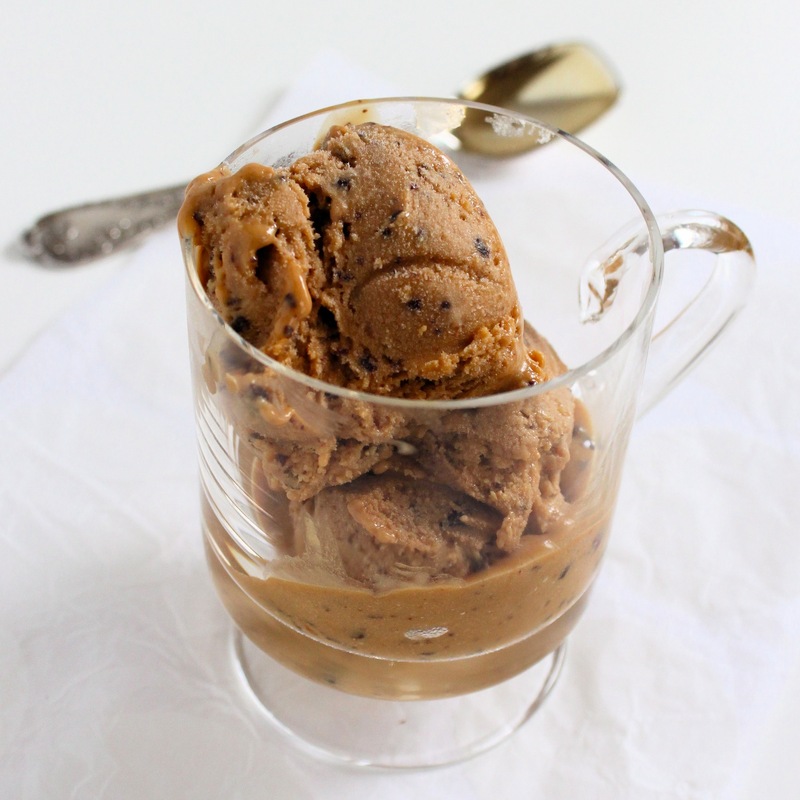 It churned out one of the richest, creamiest most simply ridiculously over the top ice creams I have ever experienced, store bought or homemade. Seriously. You should probably have to take out a permit to handle this ice cream. The caramel base is a satisfying one for someone new to making ice cream because it keeps the end product from getting rock hard, which happens often with homemade ice cream. I couldn’t even finish a whole bowl, which is lovely because it means it will last longer! This ice cream is the very definition of decadent, but hey, why should I stop there. As I was trying to control the landslide of frozen vegetables and soups and unidentified objects that came cascading down on me (ouch!) as I tried to clear a space for my ice cream to freeze, some leftover frozen tart dough fell out. Obviously it was a sign. Right? So I let the dough defrost, rolled it out, and pressed it into the bottoms of my muffin tin (I don’t have any tart pans!) and baked it up to make a few little tart shells. Then I melted some chocolate and cream together to make a smooth dark chocolate ganache, which I poured into the tart shells and allowed to cool and harden. 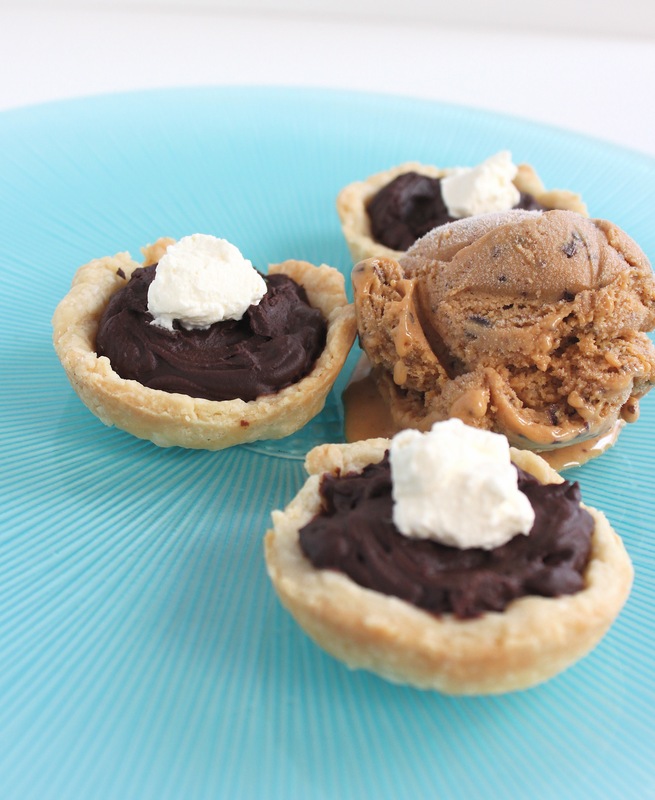 A tiny chocolate tart topped with salted caramel ice cream and a dollop of whipped cream. I don’t think regular words can describe it. I might need to write a poem to this dessert. It’s a good thing, though, that I didn’t make more than a little. It’s time to shoo my caramel beast back into its little shed to nap for a while…but I won’t stop you from taking yours out for a walk! Oh, and another quick thing before I go to the recipes, for any readers in Australia, the online restaurant guide Menulog is offering a $10 discount off of your first delivery from a participating restaurant (you know, for those nights you spent all your time making ice cream and didn’t quite get to dinner!). Just type in the code 2C5896 when you checkout online. It can be used in combination with other discounts as well. First, pour 1 cup of milk into a medium metal bowl (big enough to hold 6 cups), and put this bowl in a deep pan with ice water in it. Spread the sugar in a heavy bottomed, fairly large (about 6 qt) sauce pan. Heat the sugar over medium until the edges start to melt, then (using something heat proof) start to stir the edges and bottom of the melting sugar in toward the middle to move unmelted sugar closer to the heat. Continue to do this until all the sugar is dissolved and then keep cooking it until it turns a dark amber and starts to smell strong and dark and almost like it’s going to burn (that burnt marshmallow smell). Remove it from the heat and stir in the butter and the salt until the butter is completely melted, then whisk in the cream. At this point the melted sugar (which is now caramel, technically!) may harden in response to the cream. Just return it to low heat and keep stirring it until it is all re-dissolved and blended into the cream. Then, stir in the cup of the milk that is not sitting in the ice bath. In a small bowl, whisk the egg yolks until they’re smooth. Then, whisk in a little of the warm caramel mixture. Pour this back into the pan with the rest of the caramel, stirring well, and cook this mixture over medium-low heat, stirring constantly, until it has thickened enough that your stirring utensil leaves a trail and the custard can coat the back of a spoon (a thermometer will read about 160-170F). Next, pour the custard into the bowl with the milk, add the vanilla, and stir until the mixture has cooled down. Refrigerate this mixture at least 8 hours, or preferably overnight. To make the crust, in a standing mixer or using a handheld electric beater, cream together the butter and sugar on medium-high for a couple of minutes until the color has become quite light and the texture is fluffy. Scrape down the sides of the bowl, add the egg yolk and then beat again on medium-high for another couple of minutes until the mixture has become a pale yellow lemon color. Add the flour and mix on low until just blended together, scoop into a ball with your hands, pat it lightly into a thick disc, wrap in plastic wrap and chill for at least 2 hours. Before rolling the dough let it sit out at room temperature for about 20 minutes. Generously butter a muffin tin or twelve 3-inch sized tartelette pans. On a floured surface or between two sheets of wax paper/plastic wrap, roll out the dough until it is about 1/8 inch thick. With a round cookie cutter or a knife, cut circles a bit bigger than your muffin cups (or 4 inch circles if using tart pans), then carefully press these into the muffin cups, pressing the bottom and the sides around to try to keep the dough evenly distributed. If it cracks anywhere, just press it carefully back together with moist fingers, or repair it with scraps of dough. The dough should not come the whole way up the sides of each muffin tin. Gather leftover scraps of dough into a ball, and repeat the rolling and cutting procedure (you may need to chill it a little bit again first). Use a fork to prick the bottoms of the tart shells, then chill them for 15-30 minutes. In the meantime, preheat your oven to 350F. 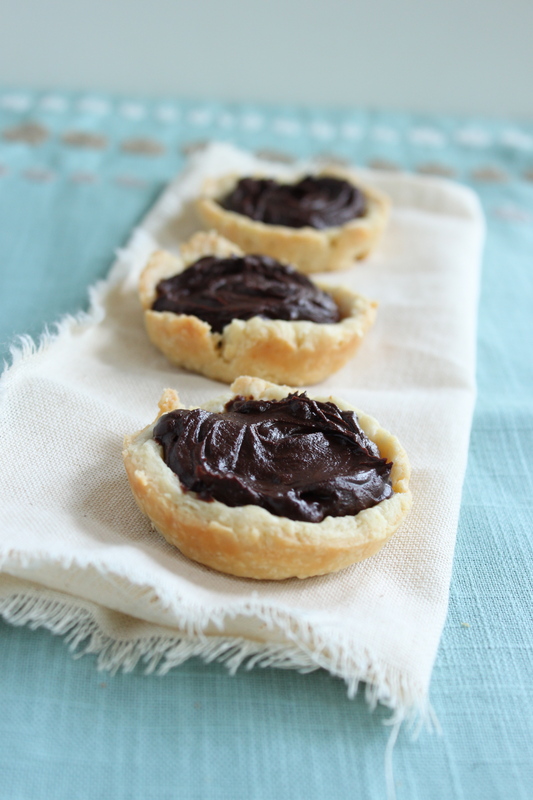 Put the chilled tart shells into the oven and bake for 15-20 minutes until turning lightly golden brown. Remove and allow to cool for about 30 minutes. Then, carefully use a knife to remove the tart shells from the pan and transfer them to a cooling rack to cool all the way to room temperature. To make the filling, put the cream in a saucepan and heat over medium-high until it just barely starts to come to a boil. Remove immediately from the heat and pour the chocolate and butter into the cream. Allow to stand for a few minutes. Slowly stir the chocolate and butter into the cream, starting from the center and moving your stirring out in larger and larger concentric circles until all of it is blended together to a uniform color. Pour the filling into the tart shells, then allow to cool. The ganache filling will firm up as it comes to room temperature. Serve the tartelettes with a scoop of salted caramel ice cream and a dollop of whipped cream. Or, just serve them plain! This is a seriously beautiful and delicious post!! I’ve got the salted caramel ice cream in the freezer and I’m just headed to the kitchen to make the tartlettes. What a beautiful recipe! Thank you. Awesome looking ice cream! Voracious Vegan, what did you use to substitute 5 egg yolks in the ice cream recipe? Hi K! I must say, I know pretty much nothing about making vegan ice cream, and have no idea how voracious vegan did it. I think it’s truly awesome and impressive the ways people find to adapt recipes. Anyway, your comment intrigued me, so I did a little research, and it seems like either xantham gum, arrow root powder, or a commercial egg substitute seem to be used most often in making eggless custards or ice cream. This didn’t last long in the freezer… My sister lives in Brittany where salted caramels are a specialty so I can’t wait to make it for her next time she visits. The dark chocolate actually tones down the strong caramel taste so is a perfect compliment. A real treat! Thanks for sharing. It definitely didn’t last long in our freezer either! I like this ice-cream very much. I have been looking for this kind of information. Keep up the good work! You are currently reading Salted caramel ice cream and dark chocolate tartelettes at Five And Spice.